Pyalong is a rural village on the Northern Highway, 23 km north of Kilmore. It was also a shire from 1863 until 1994. Pyalong was the name of a pastoral run (1838) taken up by an overlander, Alexander Mollison. It is thought that the name was derived from an Aboriginal word meaning two small waterholes dug by women. The Pyalong village was surveyed where Mollison Creek crosses the Northern Highway, about 5 km north of Mollison’s settlement at High Camp. An Anglican school was opened in 1858 and a Catholic school in 1859. They were replaced by the State school (1878). Pyalong is situated in elevated and undulating country with generally sandy soil, in contrast to neighbouring Romsey with better volcanic soil. The industries have been limited, but have included grazing and sand mining: the Mollison Creek became a receptacle for sand dislodged from eroded farmland. Other industries in the Pyalong district have included a kaolin clay mine, timber cutting (mostly for firewood) and rabbiting. A chilling plant operated in Pyalong for some years, and the carcases were taken to Melbourne by train. With the closure of schools most hamlets in the shire shrunk to localities, and the sole village in the shire’s 576 sq km was Pyalong. 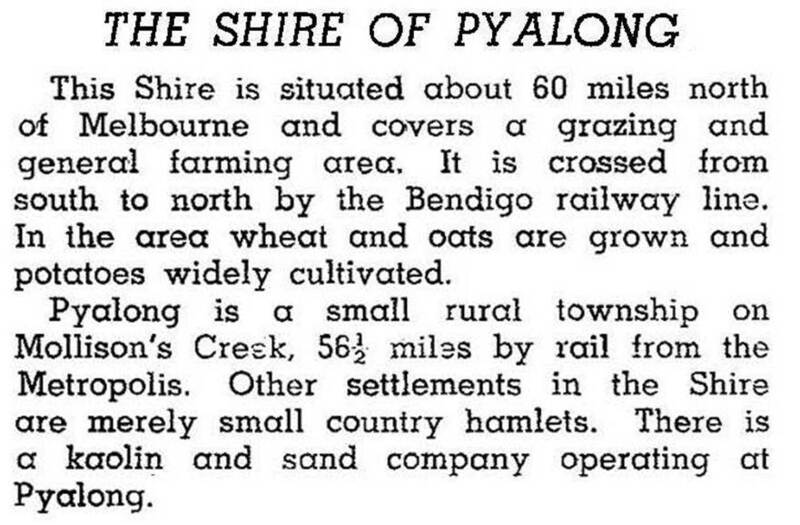 For all of the postwar period Pyalong had the smallest population of any Victorian local government area. In 1994 69% of Pyalong’s area was farmland, carrying 6250 meat cattle and 140,000 sheep and lambs. Pyalong has a primary school (43 pupils, 2014), a community centre, a golf course, a fire brigade, a general store, a hotel, a motor garage, the former shire offices and Anglican and Catholic churches. On 18 November 1994, Pyalong shire was united with most of Seymour rural city, Broadford shire and part of the McIvor shire to form Mitchell shire. At the 2011 census, farming accounted for 8.5% of employment.